This was Lee Kuan Yew breaking up a Singapore Airlines strike in 1980. His tactics were unconventional. But they were effective. He threatened to shut the airline down and in 65 minutes the pilots relented. Ranil Wickremesinghe needs to show that he has that iron in him. What does that look like? Let’s start with SriLankan Airlines. First, convict. Thanks to the Weliamuna Report we know the corrupt officials. But enough with inquiries. Start criminal proceedings. If criminal proceedings aren’t possible, start civil ones. If the police and AGs department are too busy, hire ex-policemen, private investigators and lawyers. If there aren’t enough in Sri Lanka, bring them down. If the police can’t secure evidence, offer plea bargains and rewards to find it, If the courts are taking too long set-up trials-at-bar. No excuses, just get the job done. Second, deliver. Solve the problem. Sell the airline or fix it. If neither are possible, close it. People don’t really give a damn as long as its done decisively. And in any case they won’t remember – unless the problem persists. Presidents, ministers and board members pointing fingers at each other needs to end. No more left hand thwarting what the right does. Collective responsibility needs to prevail for policy. But a single individual must be responsible for operations. The buck must stop with one person. And that person must have authority to act. But remember, problems can’t be solved by cronies. Create a culture of performance. Find the best man for the job, and give her what she needs to take it and get it done. If that means bring in ministry secretaries from outside, then do it. Third, communicate. Less lectures and more talking. Get on Rupavahini and speak to us. A few minutes a day is enough. Explain your decisions, tell us what you’re doing and why you’re doing it. Speak with one voice. When the whole government speaks in union, the people listen. And they believe. If the whole government tells people they can have Sri Lankan Airlines or 5000 rupees in their bank account next year what do you think they will choose? This is how Lee Kuan Yew governed Singapore. He started by convicting the corrupt in his own party. He brought the right people in. There were promoted if they delivered, punished if they failed. As long as it was within the law, he did whatever it took to get the job done. No orthodoxy or tradition stood in the way of results. This is well known. But what is often forgotten is that he communicated day and night. He vigorously defended his policy in simple idiom using the people’s own tongue – in the process learning Mandarin, Malay, Hokkien and Hakka. Sri Lanka and Ranil share a common fate. We grab defeat from the jaws of victory. We do too little, too late. As a result, some say that Sri Lanka is at a crossroads and always will be. I can’t believe them. There are yet enough who have iron in them. And don’t forget that in 2002, and December 2014, Ranil too counted in that number. Even at this late hour, we can build on the solid legislative reforms and new political culture of the last three years. Ranil, bring back that iron. A few convictions, a competent cabinet bound by collective responsibility, a meritocratic culture of performance imposed from the top and ceaseless communication might just turn the tide. Changing the jokey ,wont help if the horse and turf ate both not right. Here is can option for all Medias & News journals to prove how honestly they are for the people. Let them all select a few anti media -anti people news clips of the past 10 to 5 years to DATE 16/02/2018 and replay them so it will help all the people to cone out of their transient amnesia of what the Bandit’s constitution permitted politicians to harm the people and Country . Well written comments from FAHIM KNIGHT ! Thanks a bunch. I would like to add a few more points and new policies for a good government & governance. Lots of mistakes were made gradually since independence which brought our country to this low level in everything. We had the best and talented people but we let them flee the country. Still we can find talent here and give chance to them, but our prevailing political system is spoiling everything. We had the best parliament, great tea estates, great law and order & institutions, No; 1 Zoo in Asia, super university in Kandy,well working railways, super delivery postal services, efficient Doctors, Engineers, Accountants, lawyers, Teachers, great civil service employees and the list is too long.. It all happened because we had discipline, law & order along with no discrimination or political interference etc.,Because we were trained by the British and they did govern according to a workable and good constitution without discrimination. They gave responsible jobs to talented people. There were no favoritism or political interference of any sort. Look at our Tea estates today, the railways, the universities…the civil service, ..everything is in shambles. 1. Make the country a secular nation. 2. Do away with the Sinhala only thing which has done serious damage to our future generation and bring back English. 3. Do not interfere with religions and let people look after that. 4. Restrict the forced Sinhala Buddhism concept which is ruining the unity..
5.Stop discrimination of all kinds, treat all citizen alike and make them feel they belong here. 6. Entrants to universities should only be given according to merit and not by any other means. 7. Take away the damn Standardization malpractice..
9. Bring a new constitution, a good one with help from outside..
10. 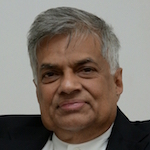 Invite well to do Lankans to pump in capital and start developing the devastated nation. 11. Stop erecting Buddhist shrines in the North & East with Army battalions where only minorities live. 12. Stop colonizing traditional Tamil or Muslim areas and intimidate them. If politicians want prosperity, peace and cooperation from all the communities they should change their attitude, be open minded, non racist and practical without prejudice. It may be hard to start but once we get into the correct track, no one can stop us or beat us. We can be proud nationals who put the country first, again. If suddhas can do it why not we ..once we were the most educated in Asia mind you.. Yes we can come back, if we have the will..and include every one by giving their due place.. Without every ones cooperation, peace or success cannot be achieved. This is my suggestion for a unified disciplined nation building….am I just dreaming or what…but this is the only probable solution I can think of..